4. It's that time of year! January means many things to many people. For some readers it's application season (grad school, jobs) or the end of the letter-writing blitz. It's also a time to reflect on the year ahead. For me and my local university colleagues, it is a time to celebrate diversity through our annual campus Summit, an exciting time of hope and shared commitment to advancing our vision of a community where everyone learns, grows, and is respected. Our annual Institute Diversity Summit draws 400-700 people to a series of workshops and panels, a keynote address and other events that inspire and inform. It takes place usually a few days after Martin Luther King, Jr.'s birthday. The program is broad; we strive to be inclusive of the many communities that make up a diverse campus. The participants come away energized and eager to improve their local circumstances and are better prepared to do so through having the attention of the university administration, the support of a broad campus network, and learning tools to address micro-inequities and other injustices in the workplace. The origin of this event was grass-roots, not top-down. Five years ago a few faculty and staff got together and asked what we could we to promote a vision of positive change for equity and inclusion on campus. Several people had already been running small workshops and events during our January intersession, so by joining forces we could bring greater visibility to our efforts and attract more people. Knowing who the interested parties are is the first step to building a successful collaboration. When I was in graduate school there came a time that I nearly dropped out because I wanted to do good in the world and wasn't sure that a PhD in astrophysics would allow me to do so. I was mistaken! Academia seems to give conflicting messages about our ideals: you should put your nose to the grindstone (or whatever the modern equivalent is for that dated phrase) to get ahead in your profession, yet we expect you to balance your career, personal life and passions outside work. There's no easy resolution. But the same can be said of most New Year's resolutions. Still, making resolutions to improve oneself and one's community, and reflecting on them annually, is a great practice. Every January I feel blessed to share this process with many others in our growing campus community devoted to equity and inclusion. Last month’s post on Unconscious Bias focused on the formation and initial job of the faculty search committee. Once the applications are in, however, the committee’s job continues. What typically happens next? 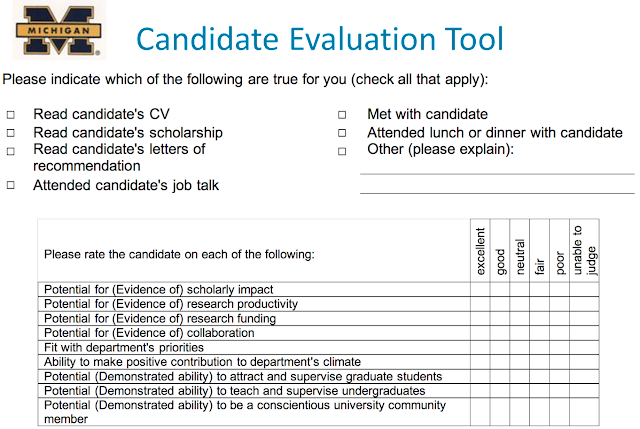 (1) search committee picks the ‘best’ candidates; (2) applications sit in a file drawer in chair’s office; (3) faculty are invited to browse through the files; (4) ‘best’ candidates are then invited to campus. This is the easiest, least painful way to go through this process. Efforts may be made to avoid conscious bias and prejudice, but opportunities abound for unconscious bias to dominate the selection. 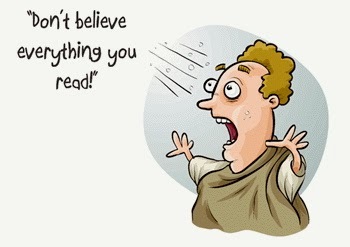 The news web site livescience.com has a series on "5 myths" in areas of health, science and society. Not all of the articles in that series are to my taste, but I liked the recent one on 5 myths about girls, math and science. Here is a summary and my take on solutions. The data in the piece come from the National Science Foundation's (NSF) Research on Gender in Science and Engineering (GSE) program. Myth 1: The myth is that girls don't like science as much as boys do. The reality is that girls and boys have equal science interests in early grade school, but already think of scientists as white males. That perception begins to turn girls off to science in later grades. My take: role models are all important. Things will improve as the number of visible women in science increases. Myth 2: The myth is that devoting extra classroom attention to girls' interest in science runs the risk of alienating the boys. The reality is that the effect is bogus. My take: extra attention to individual interests and needs in school can benefit all. Kids will perceive that the teacher is making a special effort and generally enjoy the class more. Below is a guest post is by Sarah Worsham cofounder of LadyParagons.com describing the goals of her site and how you can get involved. Do you remember what led you to a career in science? For me, I grew up with a father who was a physics teacher and then a computer science teacher. We had a computer in the house for as long as I can remember. I grew up playing mostly with boys -- my favorite toys were Legos, Transformers and anything space related. I thought science was cool -- my favorite subject at school and I had some great science teachers. In high school I decided I wanted to go into engineering so I could design cars. 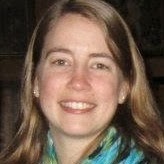 At college, my engineering classes had a minority of women, especially when I switched from mechanical to computer engineering. I did have a few female professors, but internships groups we almost entirely male. After college, being the minority gender was the norm, but I didn't let it bother me. It still doesn't, at least in terms of working with others, but it does bother me that more women aren't in STEM fields, and aren't in management and leadership roles. In light of some recent blog posts about sexual harassment at conferences and objectifying of women in a professional setting, I wanted to share my 'successful' experience with sexual harassment. Now perhaps successful it not the proper word to use here, but the below is a description of an experience where I was being sexually harassed, I did something about it, it all turned out ok, and I learned quite a bit from the process. 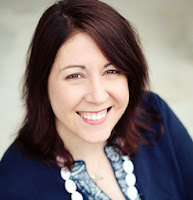 Today’s suggestion: Guest blog for the Women in Astronomy Blogspot. The Women in Astronomy Blog has continued to increase its readership and the range and frequency of posts since its inception in May 2008. We now publish a new blog post at least three times a week, over site has an average of 2,000 visitors per week with high impact posts reaching over 10,000 views. Our regular rotation of bloggers includes current CSWA members, Ed Bertschinger, Dave Charbonneau, Neil Gehrels, John Johnson, Jessica Kirkpatrick, Joan Schmelz, and Laura Trouille, as well as CSWA alum, Hannah Jang-Condell. We have also had dozens of external contributors. 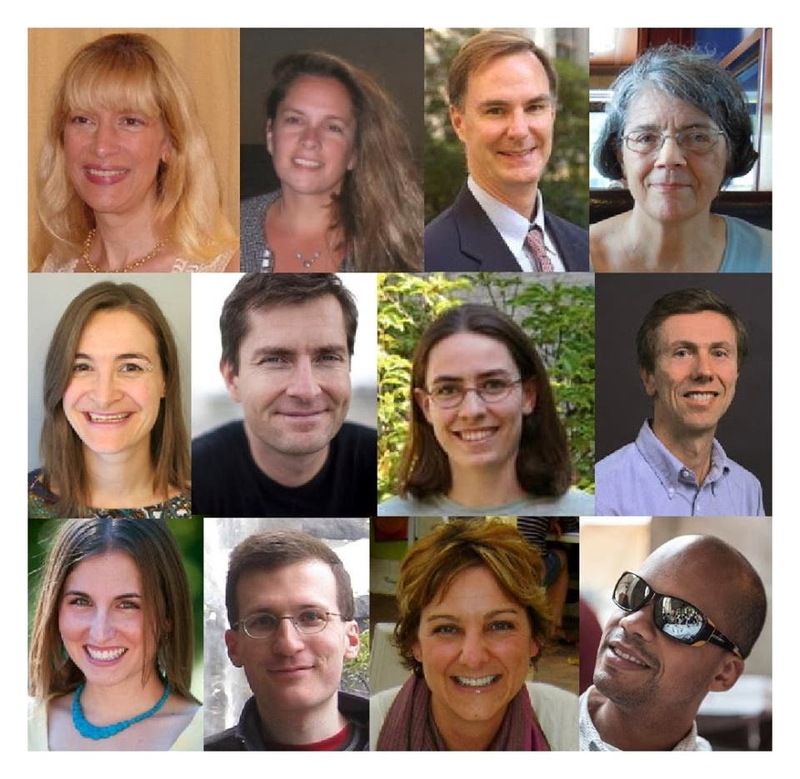 Because this large group spans career stages from graduate student to full professor and includes astronomers who have moved to careers outside academia, the blog effectively addresses concerns and provides relevant resources and advice across career stages. Topics discussed this past year included mentoring advice, role models, evolution in workplace culture/climate, work-life balance, family leave policies, job/career advice, unconscious bias, impostor syndrome, stereotype threat, bullying, sexual harassment policies, and more. The blog is linked to share entries on Facebook, Twitter, Google+ and LinkedIn. Even casual readers of the blog could not help but notice the excellent posts we get from guest bloggers. Many of these people simply volunteered after we published a request for guest bloggers in the AASWOMEN Newsletter. If you have a topic you would like to write about, send it to me at the address below. We ask for a draft ~10 days ahead of the deadline so we can read it over and make suggestions. We would also need a short bio (3 or 4 sentences) that will introduce our readers to you. Labels: guest post , What Can I Do? After joining the Committee on the Status of Women in Astronomy (CSWA), I became very interested in learning what our partner disciplines were up to. Were there similar committees in Physics, Geoscience, Mathematics, Chemistry, or Computer Science? What were they doing? And, importantly, who were the members? The Association for Women in Science has a handy list of STEM Disciplinary Societies. After following those links, I was struck by how different Astronomy and the CSWA were from most other similar committees: The CSWA has a lot of men! In 2009, the MIT Physics Department hosted a Climate Site Visit for Women and Minorities from the APS Committee on the Status of Women in Physics and Committee on Minorities. As a relatively new department head with interest in improving the status of women and minorities, I thought it would be a good practice. I was unsure how it might be regarded by the faculty, but I paved the way by getting from buy-in from my department's Visiting Committee. The procedures followed were very similar to those described in the earlier blog post CSWA Climate Site Visit Program for Astronomy Departments - Procedure. The main difference was the presence of a member of the Committee on Minorities, so that the site visit also assessed the climate for minorities. I had specifically requested this addition and was very pleased it could be accommodated. Our site visit experience was excellent: several esteemed physicists, both women and men, spent a day in my department meeting with faculty, staff, students and postdocs. They came prepared with the results of the survey, so knew some of the issues facing the department and hence were able to focus their efforts effectively. The private report-out to me was valuable in emphasizing some of the challenges we faced as a department, providing me with honest feedback and constructive advice. This is often hard for a leader to get those who are treated unfairly don't always speak up, and it is impossible for one person to hear equally from everyone in a large organization. Even internal surveys have limited success because, despite assurances of confidentiality, some respondents may be concerned about retaliation. They may be more willing to speak to outsiders. The site visit committee gave me another set of eyes and ears to the department. As a graduate student, I participated in a Committee on the Status of Women in Physics (CSWP) joint site visit of the physics departments at Lawrence Berkeley National Labs and University of California, Berkeley. The site visit was very valuable for both departments in highlighting not only the areas where we could improve in creating supportive environments for women, but also areas where we were doing quite well. First I'd like to say that site visits create a better department for everyone. Women (and other underrepresented groups) tend to be disproportionately negatively affected by general climate issues within departments. For instance, graduate student salaries effect everyone, and having higher salaries helps with recruitment and retention for both genders. However, we found at Berkeley -- a public school that tends to pay graduate students less than our private school competitors -- that admitted female graduate students were disproportionately more likely to reject our offer based on salary than male students. Perhaps this is because women are more likely to anticipate having a family while in graduate school, and are more concerned about finances than their male counterparts? I don't actually know the reason. All I know is that increasing salaries disproportionately increases the acceptance rate of women graduate students. So even if you are a person who doesn't think you are affected by the "climate for women" and that these site visits are of no benefit or interest to you, that simply isn't true. Most likely the outcomes of the site visit will be a better department for everyone. CSWA Climate Site Visits for Astronomy Departments will be initiated by an invitation from the department chair and will ordinarily last one day. The CSWA chair and the department chair will decide upon a convenient date for the visit. The CSWA chair will select a visiting team of three senior astronomers, usually from among current and former CSWA members. Prior to the visit, CSWA will administer survey questionnaires to department members and alumni. Surveys will be done using SurveyMonkey. The results of the surveys, as well as any written comments, will then be provided to the site visit team to assist them in preparing for the visit. All survey results will be confidential. CSWA will model their surveys on those of CSWP. The goals of the CSWA’s visits are to: increase the committee’s knowledge about problems experienced nationally by women students, postdocs, and faculty in astronomy; work with departments to identify problems; suggest means by which the department might solve those problems; and improve the climate for women generally. 3. Closing Time at the "Astronomy Nightclub"
4. Interested in hosting a future Conference for Undergraduate Women in Physics? Yoda gets a nice benefit from his mentee. Today's guest post is by Wen-fai Fong, a graduate student in the Harvard Astronomy Department. Wen-fai will be graduating with her PhD this coming Spring and she studies the galactic environments of gamma ray bursts (GRBs). Since arriving at Harvard, I have been very impressed with Wen-fai's leadership and initiative in establishing mentoring within the astronomy department. Her efforts include the establishment of a peer mentoring program similar to the program I benefitted from at Berkeley, and a new faculty-peer mentoring program. The programs were recently recognized and funded by Harvard University through a GSC grant. Given her experience over the years with mentoring, both as a mentor and mentee, I asked her to share her thoughts with the Women in Astronomy blog readers. Lying on my couch on Thanksgiving Eve, nearly comatose from uncomfortable amounts of turkey sitting in my stomach, I flipped on the TV. To my delight, Star Wars: Return of the Jedi was playing. A few commercial breaks later and I was wide awake, weeping during the scene in which Yoda dies. 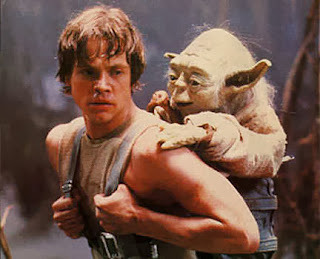 This got me thinking: Yoda was such a fantastic mentor to Luke Skywalker, and Luke obviously went on to do great things. But what the heck did Yoda get out of it? I let these thoughts dangle in my mind as I dabbed my eyes, changed the channel and told myself to get a grip! Many articles I’ve read concentrate on the benefits of being mentored. Indeed, these studies have contributed to the ubiquity of mentoring programs in working environments. From business schools to medical schools1, from small start-ups to tech moguls like Google... even the U.S. military2 recognizes the impact of mentoring on the mentees. But why should people want to be mentors, especially in the stereotypically emotionless world of science and academia? The 2010 report entitled, Why So Few? 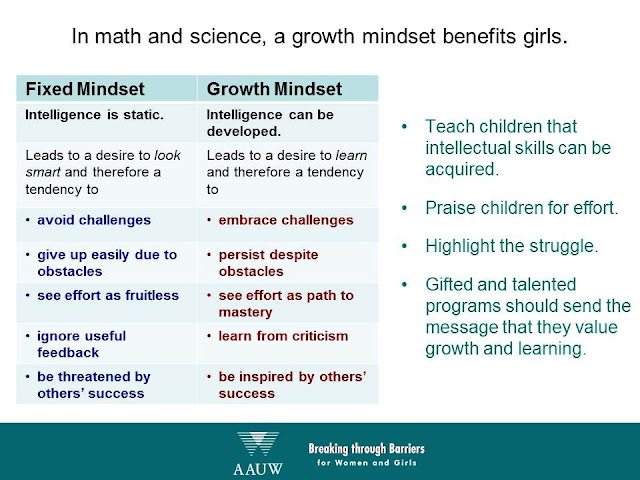 Women in Science, Technology, Engineering, and Mathematics, by the American Association of University Women (AAUW), finds that girls’ interests in math and science are shaped by social and environmental factors. The first finding comes from the research of Dr. Carol Dweck, a psychologist at Stanford University, who studies beliefs about intelligence. She finds that believing in the potential for intellectual growth, in and of itself, improves outcomes. Dr. Dweck’s research provides evidence that a “growth mindset” as opposed to a “fixed mindset” benefits girls in math and science. The table lays out the differences between a fixed mindset and a growth mindset. Individuals with a “fixed mindset” believe that intelligence is static. Because of this, they want to always “look smart” and therefore, tend to avoid challenges, give up easily when they encounter an obstacle, see effort as fruitless, ignore feedback, and can be threatened by others’ success. In contrast, individuals with a “growth mindset” believe that intelligence can be developed. Because of this they want to learn more and, therefore, tend to embrace challenges, persist when they encounter obstacles, see effort as a path to mastery, learn from criticism, and be inspired by the success of others. Closing Time at the "Astronomy Nightclub"
Today's guest post is from an astronomer friend of mine who moved to the states relatively recently. Her story is not her's alone. I have heard the types of stories she will describe below from many independent sources over the years (dozens, sadly). I have found it increasingly disturbing that certain serial harassers are free to ply their disgusting trade freely within our community. They are not reprimanded because they are highly skilled at covering their tracks and intimidating their victims. Also, universities tend to protect their high-profile professors much quicker than they are to back their younger employees. Readers: no matter how you might perceive the interactions described below, the key thing to consider is not whether you feel it's right or wrong. Human interactions involve two people, and two sets of experiences and opinions. So please avoid the simple-minded response of, "Jeez, I don't see why this is such a big deal!" in your comments. That response is just not intellectually compelling in my view because it lacks empathy. It takes a lot for a woman in science to speak out about these issues (hence the anonymity of today's guest blogger). I feel it's important for us all to hear them out and try to walk a bit in their shoes rather than sticking to our limited set of personal experiences. Thanks for your attention and thoughtful feedback, dear readers! In my home country women get remarks on their looks on a daily basis. It happens when they walk down the street, when they are at the grocery store, and sometimes even at work. Here in the US, this doesn't happen so often, and I like it. Especially at work where I can focus on science and nothing else. There is a generally accepted "rule" that we are all scientists in the scientific workplace (for the most part anyway). Yet, something goes wrong at science conferences; so wrong it tips the balance between men and women in science. It took me a while, with the help of friends, to figure it out (maybe even too long). The rules are subtly different at conferences. What is going on? 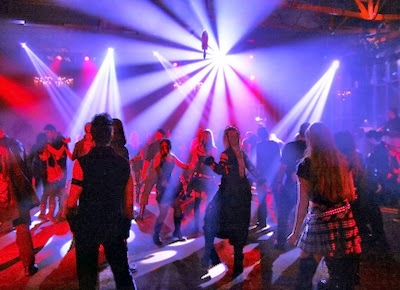 It makes me wonder: is this a conference or a nightclub? Here is a situation: at the end of the conference day several men and a few women (we are often much fewer in number than men) are having dinner and a professional chat. Suddenly one of the women gets a compliment about her eyes (or some such thing). 4. How this is Related to Astronomy? The holiday gift season is winding down now, which is a big relief to me. I even managed to avoid stepping foot into Toys R Us this year. Why do I despise Toys R Us so much? Because when you walk in, the store is neatly divided into the PINK half, and the black-and-blue half. It drives me crazy how gender-segregated children's toys are these days. This article about the toy aisles in Target is spot-on, if extremely snarky. "Pretty much everything in the pink aisle was designed in a way that limited the number of stories you could tell with it. In the blue aisle, accessories vary. There’s a Batman with a submarine. There’s a ninja with a castle. Not in the pink aisle. Everybody just had hairbrushes." Goldie Blox seems like a great way to combat some of this, but then again, why should you need a special building toy that's marketed just at girls? The answer, I think, is that most girls are stuck in the pink aisle. Kids are smart, and learn gender roles at a very young age. It is clear to them that pink-and-purple toys are for girls, and everything else is for boys. I know so many parents who insist that they tried to dissuade their daughters from liking pink, but failed anyway. But it's unlikely that the girls just inherently liked pink, since pink for girl is purely a socialogical convention. You might say that this child is a "girly-girl" or that child is "all boy," but how much of that is just a result of the marketing that is directed to them? How much of that is just the positive feedback loop of reinforcing their interests in the items that are gender-correct for them, while ignoring everytime he picks up a doll or she throws a ball? Why am I so concerned about girls' toys, especially since my kids are both boys? It's because by limiting girls to a certain category of toys, you limit their imaginations and skill development. * By putting together and taking apart LEGOs, you might learn some basic geometry and engineering. By pretending to be a superhero, you might learn how to take charge and be a leader. If their toys are only about princesses and brushing their hair and makeup, then no wonder that by middle school girls lose interest in science and math, even though their achievement remains as good as or better than boys. So I do support toys like Goldie Blox that both appeal to the girly-girls and develop their creativity. *I also think that having boys play with dolls and toy kitchens instead of nerf guns and cars might make them more empathetic and allow them to develop a wider emotional range, but that's a topic for a different post.